​Basinkomstpartiet (the Basic Income Party) has started as a reaction to the fact that none of the established parties in Sweden push for a serious discussion on basic income or citizens' wage. Although the many global pilot projects and collective research since the 1960s show enormous societal and social benefits directly linked to unconditional basic economic security, Sweden's politicians continue to avoid the issue. It is time for basic income to be placed firmly on the political agenda. 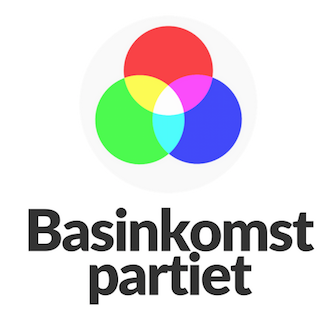 Basinkomstpartiet (The Basic Income Party) stands outside the traditional right-left paradigm and instead bases its political stance on the 17 Global Human Rights listed in its Convention. The goals include eliminating poverty, reducing inequalities and injustices, and resolving the climate crisis, while the Convention on Human Rights, Article 25, states that " Everyone has the right to a standard of living adequate for the health and well-being of themselves and of their families, […], and the right to security in the event of unemployment, sickness, disability, widowhood, old age or other lack of livelihood in circumstances beyond their control". Basinkomstpartiet [The Basic Income Party] thinks that regular individual payments, enough to secure basic needs and without condition, is the simplest and least bureaucratic way to accomplish this. ​What happens when the Basin Party enters the Riksdag (Parliament)? To immediately order a politically independent inquiry into the details of the introduction of basic income in Sweden. This is possible as all parliamentary parties have access to the Parliament Investigation Service (RUT). To work short-term for the start-up of pilot projects with basic income in Sweden. To work long-term to gradually introduce full-scale basic income across Sweden. Basinkomstpartiet [The Basic income Party] wants to actively keep the issue of economic basic security alive in all social policy areas. Specifically, this means that we work short term for a social security network that does not allow people to fall between the cracks.